A quick post in continuation to the previous post. Food for fasting souls. Sabudana i.e sago or tapioca seeds are quite filling due to their high starch content. Sago seed powder also acts as a good thickener for stews and soups. The recipe below is for Sabudana Khichdi, a simple assembly of modest ingredients to keep the hunger pangs away while fasting. Serve with plain yoghurt topped with roast cumin powder with side of freshly cut fruits. Soak sago seeds in water overnight or at least 4-6 hours. By morning, the sago seeds should be soft and should have absorbed the water. 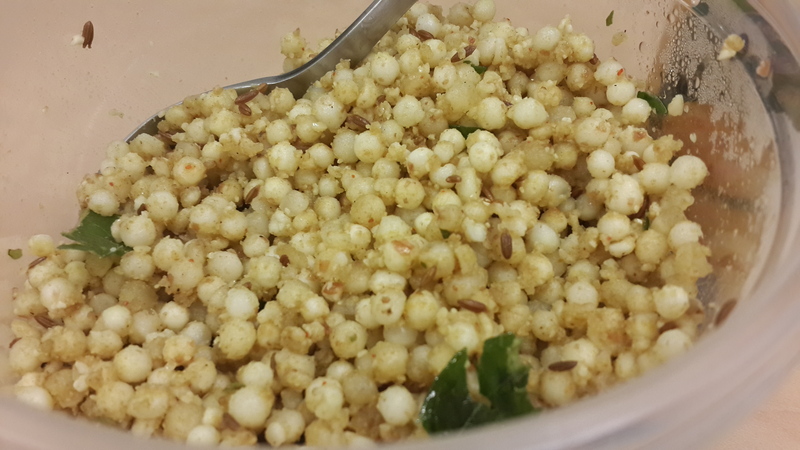 Add coriander powder, cumin powder and rock salt to the sago seeds and mix it well. Pour oil on a wok on medium heat, add cumin seeds, curry leaves and green chillies and let it sizzle. Add powdered peanut powder, you can buy the readily available powdered peanut from Al Adil or roast peanuts and give them a mix in the spice jar. Let it cook for a minute or so and add the sago seeds mixture. You can also add diced boiled potato cubes to this to give the khichdi more body and make it more filling. Garnish with coriander leaves and serve with chilled yoghurt.